A clear alternative to braces®. Over 4 million patients are smiling with confidence thanks to Invisalign clear aligners. Without brackets or wires, this clear aligner treatment takes a modern approach to teeth straightening and is virtually invisible. Dr. Tyler is a certified Invisalign provider. However, certain complex cases may require referral to an orthodontist. Teeth that are not aligned properly in your mouth create what dentists call “malocclusion.” Left untreated, malocclusion can lead to gum disease (periodontal disease) and create abnormal amounts of stress on teeth and jaws, which can lead to premature wear. Crowding – not enough room for the teeth; build up plaque and tartar easier; at higher risk of periodontal disease, tooth loss, and bone loss. Spacing – gaps between the teeth; food lodges between teeth; risk of periodontal disease and bone loss. Edge to edge bite – upper and lower front teeth hit edge to edge; risk of teeth chipping and breaking; jaw joint pain; shortened or worn-down front teeth. Deep bite – upper front teeth hiding lower teeth; over-erupted lower front teeth that can damage the palate; premature wear and chipping of the lower front teeth. Open bite – vertical spacing between upper and lower front teeth; abfraction (small notch in tooth at gumline); gum recession, loose teeth, and bone loss; excessive, premature wear on back teeth. Invisalign treatment can fix malocclusion problems. The treatment involves a custom-made series of clear aligners created for you and only you. These aligners are made of smooth, comfortable and virtually invisible plastic that you simply wear over your teeth. Wearing aligners will gradually and gently shift your teeth into place, based on the exact movements your doctor plans for you. There are no metal brackets to attach and no wires to tighten. You simply put in a new set of aligners approximately every two weeks, until your treatment is complete. 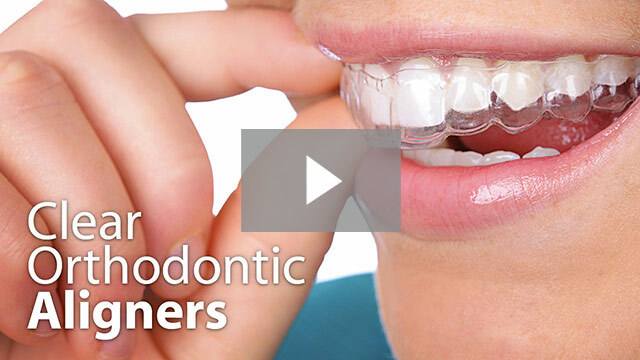 The clear aligners are comfortable to wear and easy to live with. You visit your doctor every 4 to 6 weeks to check your progression and get new aligners. Average treatment time is about a year. Because the aligners are removable, you can continue to eat your favorite foods as well as brush and floss normally to keep your teeth and gums healthy. The best part about the whole process is that most people won’t even know you’re straightening your teeth. Dr. Tyler is able to provide Invisalign treatment using CEREC advanced digital technology. Yes! After completion of clear aligner treatment or traditional orthodontics, using braces, you must wear a dental retainer for life (or as long as you want to keep straight teeth). An orthodontic retainer is given to a patient after treatment to keep the teeth from returning to their prior position or simply to prevent them from shifting. It is important to wear the retainers as prescribed. Failure to do so, may result in the need to go through treatment once again. Also, if not worn often, the teeth may move so that the retainer will no longer fit. If this happens to you make sure to contact Dr. Tyler as soon as possible. There are two types of retainers: fixed and removable ones. Removable retainers can be taken off for teeth brushing and eating. Fixed retainers, on the contrary, can only be removed by the doctor. 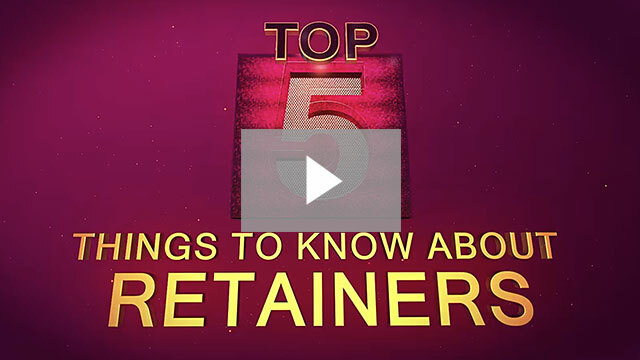 When it comes to retainer design, there are various options. A Hawley retainer consist of a plastic base attached to a wire that wraps around your teeth. Another common type is an Essix retainer. Essix retainers are made completely of clear plastic, similar to an Invisalign clear aligner and are virtually invisible, making it a popular choice. Also, there are bonded retainers. These are permanent retainers glued to the back of patient’s teeth. Dr. Tyler is able to fabricate Essix retainers using CEREC advanced digital technology. Retainers can carry bacteria as well as wear, if not properly taken care of. For Hawley retainers, make sure to clean them on a daily basis with your toothbrush and water. For Essix retainers, it is recommended to clean them with some of denture cleaner or a retainer cleaning product. Be sure to rinse them well, when using some liquid antibacterial soap to clean them since most solutions contain chemicals that should not be ingested. Also, make sure to not wash your retainers in hot water since this may cause damage or affect its structure. Fixed, bonded retainers take effective oral care to avoid problems. If not properly cleaned by brush and floss, they become a plaque trap. This can lead to tooth decay and gum disease on the teeth that the retainer is bonded to. For any further questions about Invisalign or orthodontic retainers please do not hesitate to ask us.